and one of the most famous women in 20th century politics. She was India's first and to date, only female Prime Minister. 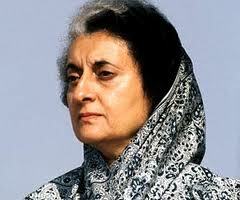 Born in 1917, Indira Gandhi rose to the title of Prime Minister in India despite facing many challenges along the way. In 1947, her father, Jawaharlal Nehru, became independent India's 1st Prime Minister (1947-64). Indira traveled with her father extensively and met many politicians along the way. In 1959 she was elected to the Presidency of the Indian National Congress, and later appointed as Minister of Information and Broadcasting. After Prime Minister Lal Bahadur Shastri's dealth in 1966, Indira Gandhi served as Acting Prime Minister. In 1967, she was elected Prime Minister and became the first women ever to lead a democracy. She was known for improving relations with China and the Soviet Union and for her emphasis on the progress of science and technology, space exploration, and irrigation. During her term in office Indira Gandhi faced enormous problems in Assam, Punjab and east Bengal, in addition to increased tensions with Pakistan. In 1984 she used the military to suppress Sikh rebels and ordered an attack on a Sikh shrine in Amritsar, known as "The Golden Temple". The Harmandir Sahib or Darbar Sahib informally referred to as "The Golden Temple", is the holiest shrine in Sikhism. 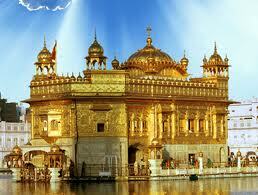 It is located in the city of Amritsar. Many Sikhs regarded the attack as a desecration of their holiest shrine, and their alienation deepen. In 1984, she was assassinated by her own bodyguards, apparently in revenge for her ordering of the storming of the "Golden Temple of Amritsar". My grandfather once told me that there were two kinds of people: those who do the work and those who take the credit. He told me to try to be in the first group; there was much less competition. Whenever you take a step forward, you are bound to disturb something. You must learn to be still in the midst of activity, and to be vibrantly alive in repose. People tend to forget their duties but remember their rights. My father was a statesman, I am a political woman. My father was a saint. I am not. We have believed--and we do believe now--that freedom is indivisible, that peace is indivisible, that economic prosperity is indivisible. A nation' s strength ultimately consists in what it can do on its own, and not in what it can borrow from others. One must beware of ministers who can do nothing without money, and those who want to do everything with money. I know that the violence will be in the thought and the action of the assassins, not in my dying. Want more information on India? Here are some useful links.